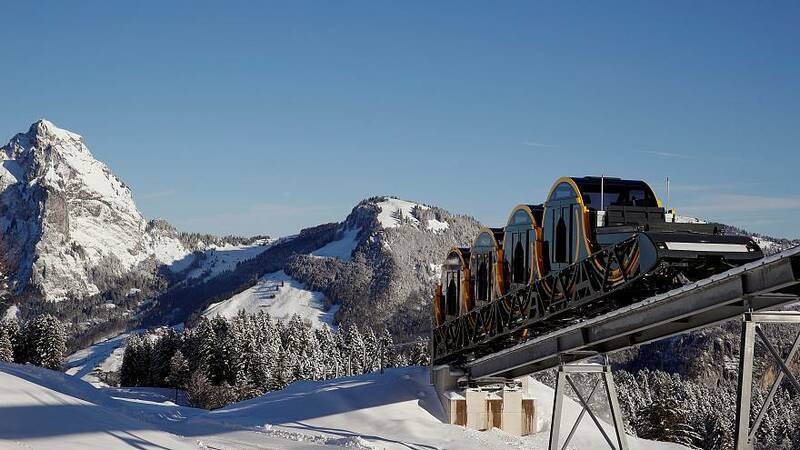 The world’s steepest funicular line is set to be unveiled in Switzerland on Friday, reports Reuters. The new railway, which cost 44.6 million euros, will be officially opened by the country’s president, Doris Leuthard. It has unusual barrel-shaped carriages that adjust their floors so passengers can still stand upright even as they go up at steep inclines. Gradients up to the Alpine resort of Stoos can reach up to 110 percent. The train, which will go into public service on Sunday, will climb 743 metres over a span of 1,738 metres, at speeds of up 10 metres per second. "After 14 years of planning and building, everyone is very proud of this train," said Ivan Steiner, spokesman for the railway. The new funicular is replacing an older one that was first put into service in 1933. The Gondola Project, a specialist website focussing on cable-propelled transport, wrote: “Construction of the new funicular began in July 2013 but faced several delays resulting from the collapse of a materials cableway and difficulties associated with tunnel drilling. Nevertheless, tracks were finally laid in April 2017 while the system is scheduled to open on December 17, 2017. The Gelmerbahn, also in Switzerland, which has a maximum gradient of 106 percent, was previously Europe’s steepest funicular.